Xander Schauffele lines up a putt on the 18th green during the final round of the Masters. While most people may be talking about the Masters finish because of Tiger Woods' triumph, one local golfer can be proud of his best finish ever at the event - in a three way tie for second, one shot behind the leader. 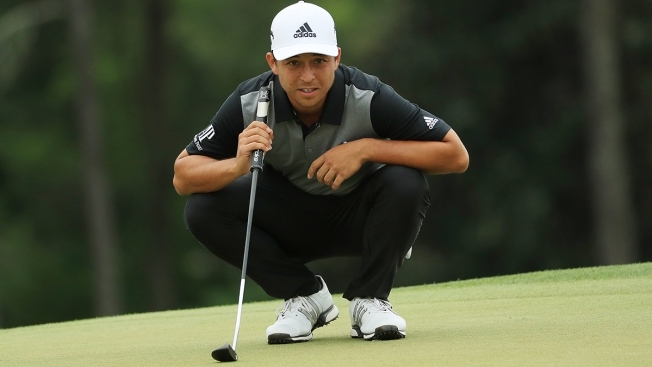 Xander Schauffele started Sunday at 8-under. Then, there was a seven-hole stretch that included five birdies that capped on the 14th hole. He reached 12-under and took the lead but slowed down from there. "What a week! So close but pumped for my finish in the end," Schauffele posted to Twitter. "Thanks for all of the support this week @TheMasters. Congrats @TigerWoods!" Schauffele finished in a tie for second place, one back of Woods. While it wasn't a win, Schauffele got a clearer idea of his potential. "I told my caddy on the 18th, I shot one over my first round and clawed my way back to where I'm at now," he told CBS Sports after the competition. "We just proved to ourselves we can win here. Which is an awesome feeling." Schauffele attended Scripps Ranch High School and San Diego State University. In January, the San Diego native got his first chance to play with Woods at the Farmers Insurance Open.